Over here at The Perfect Details we love Martha Stewart Weddings. Anything MSW is immediately popular. She made DIY trendy as well. A bride loves the idea of customizing her wedding but doesn't always know where to start. You an always count on MSW for having great ideas for brides and when we saw this feature for a menu made of vellum that housed a lovely piece of bread, I immediately stored it away as a great idea along with probably a million other brides. Recently I took a more detailed look at this post and figured out why I probably never attempted it before. For one thing, the directions are quite minimal and the many frustrated comments left by people trying to re-create this piece of cuteness showed me that my frustration was shared. When I opened the original template and printed it, it took me about 15 minutes to print, cut, score, full, and tape the sleeve together. That means that you could only make about four per hour which is not very productive now is it? The look was very nice but not easy to replicate. Could I re-create this project to make it more simple but still offer the beautiful aesthetic worthy for a wedding? 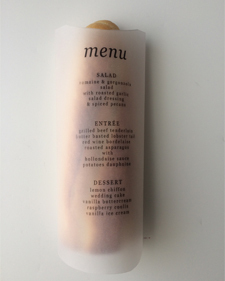 I decided to take a crack at making this bread sleeve menu and to once and for all, demystify this DIY! Some of the most difficult and time consuming parts of this MSW project is involved in the cutting, scoring, and folding of the vellum. Vellum paper has a very brittle and plastic-like quality to it. If you score too hard or fold too firmly, you can easily rip right through the vellum. In the MSW picture it is a little deceiving because it looks like the bottom of the sleeve is closed like a bag. But in essence it's literally a tube to slide the bread into. I took the concept of the /tube sleeve and gave it a more streamlined approach making it easier to trim and put together. My version took less than five minutes from start to finish. That means you could get at least 12 done per hour which is a lot better than four don't you think? that I printed and assembled. This one took 15 minutes. This is my version. I created different menu copy but otherwise, I think they look very similar! This one took 5 minutes! if you're interested in trying out your own vellum bread sleeve, The file and detailed directions are available at my online store! Legal Stuff: The instructions and template contained in this digital file are proprietary and protected by the copyright of The Perfect Details 2015. This is intended for personal or recreational use only and may not be published, copied, shared or distributed without express permission from Donna Kim of The Perfect Details.